As our sponsored students join their respective secondary schools, their faces are full of smiles and joy. They couldn’t be more excited about this adventure which is the chance of a lifetime – the dream of continuing with their education beyond just a primary school. Just a few months ago, this felt like a dream to Tracy and Billy, two orphans from Sons of Manaseh children’s home. Their primary education in its final year was a very hopeless time. The director of the orphanage where they live had just passed away and with no sponsors to guarantee their education, their dream of transitioning from primary to secondary schools was just that, a dream. The stars aligned and Moja Tu was connected with these two students and the news that they would be sponsored to continue their education was the best news they could imagine. They promised to work hard to get accepted into a high performing secondary school based on their National Exam scores. Tracy is a bold, soft spoken girl. She always has a sweet smile despite the hardships she has been through. This smile has been made even stronger thanks to her sponsor. She is now enrolled at Bishop Mazzoldi Secondary School, which is a high performing school that is considered very competitive. 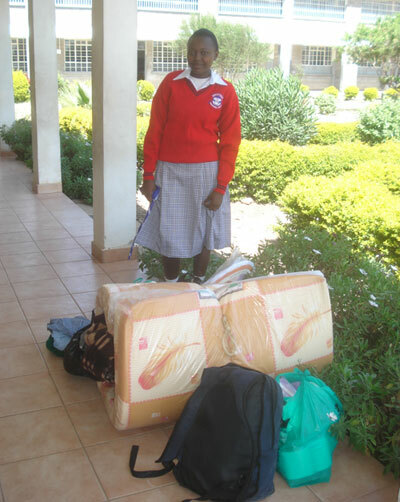 Here is a picture of Tracy as she is dropped off at her school with all her belongings, which literally range from A to Z – items include mattress, sheets, towels, toothbrush, dictionary, socks, uniforms, calculator, etc. Billy is soft spoken and a shy young man with good football skills. He was accepted into Ngenia Secondary school, a missionary boarding school not too far from the orphanage. We couldn’t keep the smile off his face as he joined the first day of school. While shy, he was very proud looking in his brand new uniform, this was the first step in helping build his confidence. All of the eleven sponsored students heading into secondary school for the first time were nervous to start this big adventure. This is such a big transition for these students that their anxiousness showed. They expressed fears of “What if the uniform I will be given does not fit, what if my items are stolen, what if I run out of supplies in the middle of the term”. As part of the student sponsorships, Moja Tu provides students with a small allowance to give them financial responsibility and allow for these unknowns. Students feel more confident that their basic needs are taken care of, as they venture into this new world, typically not knowing anyone there. Additionally, Margie who is our feet on the ground in Kenya, will be visiting all of the students in their respective schools throughout the course of the year to ensure that our students are doing well and are taken care of. We are so proud of our students for being brave as they take this opportunity of a lifetime and make the very most of it.